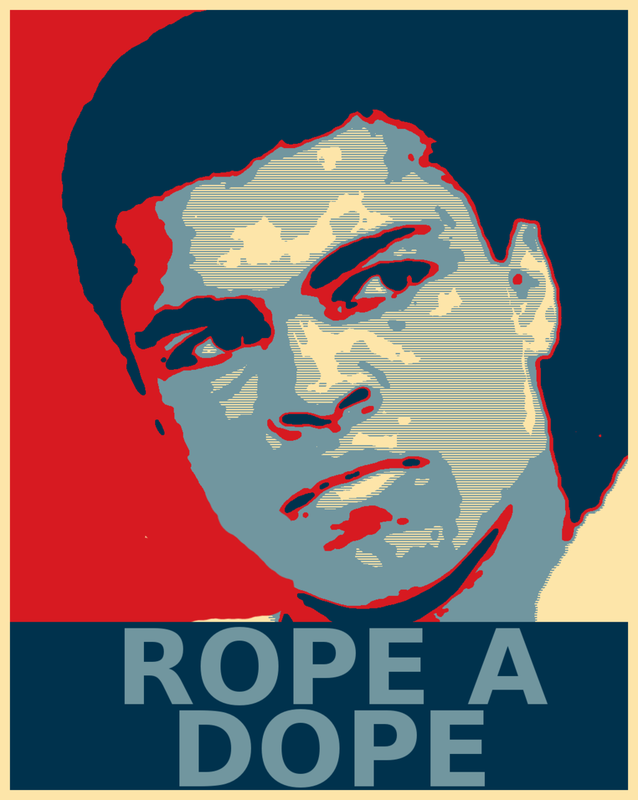 Obama’s Opening Remarks in the Second Debate: Rope-A-Dope! | Paul's Voyage of Discovery & Etc. Obama’s Opening Remarks in the Second Debate: Rope-A-Dope! On October 16th at 9:00 PM Eastern Time, President Obama and challenger Mitt “Etch-A-Sketch” Romney will tee off their second Presidential debate. 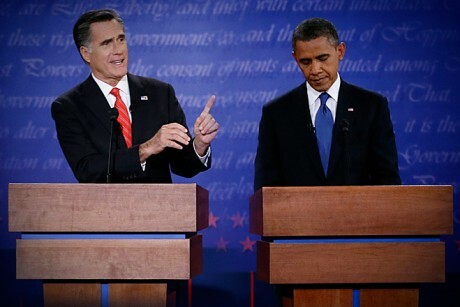 For this second round in the Obama vs. Romney heavyweight contest, the bipartisan Commission on Presidential Debates has planned a “town meeting” format in which “undecided voters” chosen by the Gallup Organization will ask questions on topics critical to our nation, including foreign and domestic policy. After the poorly moderated, constipated and confused “six 15-minute pods” framework of the first debate, Presidential Cage Match Round Two – driven by questions from “real people” — may be more enlightening, exciting and decisive. 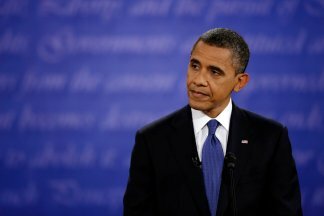 As a progressive Democrat, I must honestly admit that I came away from yesterday’s first debate full of anger and frustration that President Obama didn’t immediately counter Mitt Romney’s shocking shape shifting, evasiveness and outright dishonesty with force, passion and prosecutorial specificity. Damn. 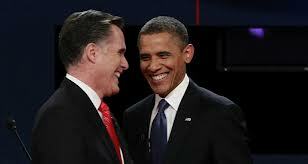 I really, really, really wanted Obama to take Romney’s head off in that first debate. PBS’ grand venerable gentleman Jim Lehrer certainly wasn’t going to do it. But there’s an argument to be made that Obama was playing “Rope-a-Dope”. There’s an old axiom in war and politics that if your opponent is hurting himself — don’t get in the way. 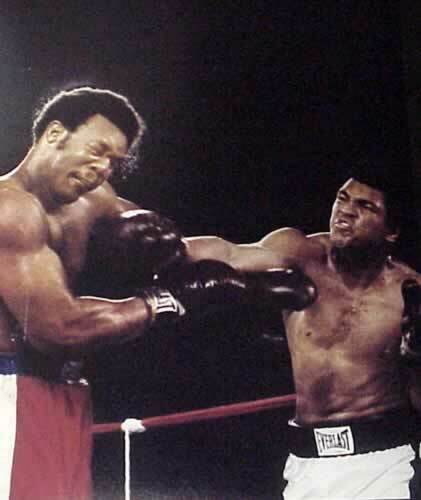 In one of the most celebrated heavyweight bouts in boxing history, beastly strong, aggressive and overconfident George Foreman wore himself out throwing punch after punch at the cagey veteran, Muhammad Ali, who settled into the ropes in a defensive crouch. 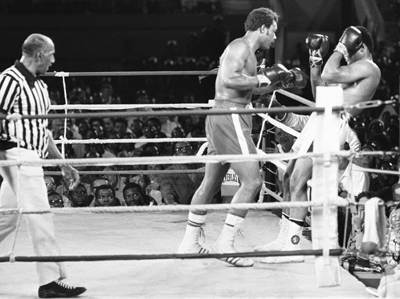 When Foreman’s bulging, muscled arms finally tired, Ali put his exhausted foe away with canny, savage, and well-timed counter-punching. 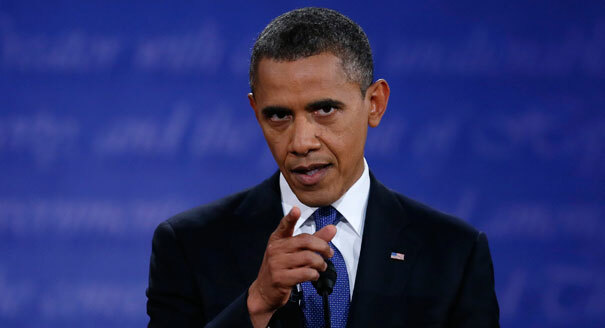 If we equate whole new policy positions, bald-faced lies, equivocations, mischaracterizations and a chronic lack of specifics with lunging punches thrown without a knockout – then President Obama has set Mighty Mitt up for a ferocious counterattack. With that in mind, here’s what I’d like to hear President Barack Obama say in his opening statement in the second debate. 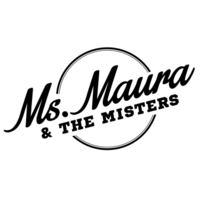 “Thank you, Candy Crowley, for moderating this debate, thanks to Hofstra University for hosting us – and thanks to everyone watching for taking the next 90 minutes out of your very busy lives to listen to what Governor Romney and I have to say about our drastically different visions for the direction we want to take our beloved country. I know you just got home from work and that you need to get up and go back to work tomorrow morning — so I won’t waste your valuable time by saying a bunch of things that sound good tonight – but that the fact-checkers will easily prove are a lot of crap tomorrow morning. 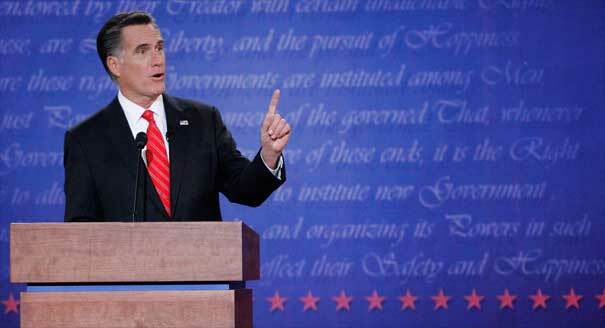 I’ll leave that game to Governor Romney: whichever Governor Romney shows up tonight. Tonight’s debate is supposed to be a town hall meeting — in which citizens ask the questions, and Governor Romney and I have agreed to answer your questions. I promise to answer your questions honestly and candidly, consistent with everything I’ve said from the time I sought the Presidency in 2008 until tonight. Tonight, I challenge Governor Romney to answer your questions in a manner consistent with what he’s been saying in the past year, in the last few months, and in our last debate. Governor Romney’s not an easy guy to pin down on policy. It’s impossible to know what his plans for our nation are. In fact, Mitt Romney is the biggest flip-flopper in American political history. Mitt was for Obamacare before he was against it. He was for a 5 trillion dollar tax cut before he was against it. He was for lowering taxes on millionaires and billionaires before he was against it. He was for voucherizing Medicare before he was against it. And he was for his VP pick Paul Ryan’s Medicare and Social Security-killing budget before he was against it. 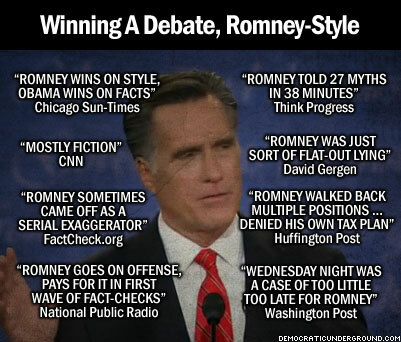 And Governor Romney did all that flip-flopping in our last debate less than two weeks ago. I wonder where Mitt Romney stands now? 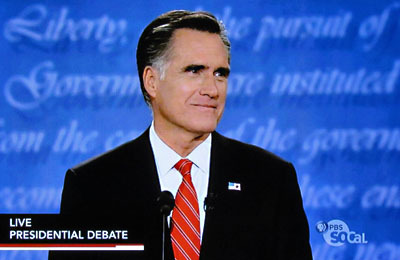 I wonder which Mitt Romney will show up tonight? And what new tales will he tell? Maybe tonight we’ll get the real story of Mitt Ronmey’s plan for the American middle class? Like a “CSI” or “Law & Order” mystery – it’s worth staying up for the next hour or so just to find out. Why did Governor Romney run away from so many of his previously held positions? And why won’t he say what upper-income tax loopholes and middle-class tax deductions he plans to eliminate to pay for his huge tax cuts for millionaires and billionaires? 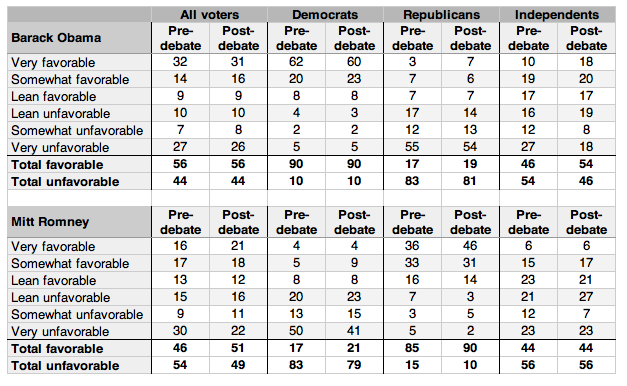 Post Script: The first national poll after the first Presidential debate from Ipsos/Reuters shows that President Barack Obama didn’t lose much ground. Did you send that opening statement to David Plouffe yet? ?